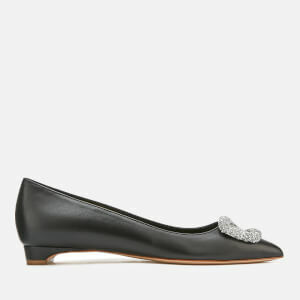 Crafted in Italy from smooth leather, the women’s ‘Clava’ court shoes from British luxury footwear label, Rupert Sanderson, showcase a sleek pointed toe adorned with the brand’s signature pebble embellishment in gold-tone metal. Set upon a leather-wrapped block heel with a treated leather sole for grip and finished with patent gold branding on the footbed. Tonal stitching throughout.